Governor Sununu’s State Budget proposal increases funding overall, but it does not increase funding consistently across all types of public services. Comparisons are often made between the Governor’s request and both the prior State Budget and the original budget requests from State agencies. To learn more about Governor Sununu’s proposed budget, see NHFPI’s Issue Brief The Governor’s Budget Proposal, State Fiscal Years 2020-2021. 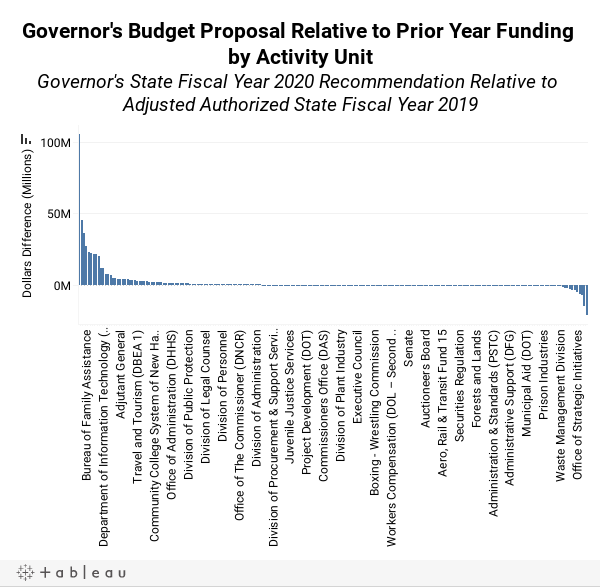 The Data Viz below shows the changes in funding levels for Activity Units, which are more granular measures of State agency operations than department-level measures, between actual State Fiscal Year (SFY) 2019 adjusted authorized funding levels and the Governor’s SFY 2020 proposal. Comparing without the context of agency requests does not permit understanding of planned department reorganizations or policy changes, so some increases or reductions may not reflect weighed policy choices as much as the evolution of agency structures or accounting units. With that caveat in mind, an examination of the funding for Activity Units, which offer a greater level of granular analysis than State agencies as whole, show that 40.3 percent of Activity Units would receive the same amount of money or less in SFY 2020 under the Governor’s proposal as they did in the SFY 2019 adjusted authorized figures, which account for changes made after the SFYs 2018-2019 State Budget was enacted in June 2017. The percentage of Activity Units receiving fewer dollars in SFY 2020 than in the current year under the Governor’s proposal would be 30.6 percent. Some of the largest increases by Activity Unit are in the Office of Medicaid Services, reflecting the increase in expected Medicaid uncompensated care payments to hospitals, as well as for the Division of Developmental Services, nursing home and Choices for Independence Waiver services for individuals receiving care in their homes, the Bureau of Family Assistance funding for individuals receiving support from Temporary Assistance for Needy Families dollars, the Turnpikes Division, and consolidated federal aid under the Department of Transportation. A significant portion of these increases are funded with federal dollars. Some of the largest decreases are in the Department of Health and Human Services Office of Information Services and the Bureau of Child Development, as well as in the Treasury Department, the Department of Education’s Division of Workforce Innovation, and the Governor’s Office of Strategic Initiatives. For more on the State Budget process, see NHFPI’s NH State Budget web page and Building the Budget resource.